Note: Tags, groups, and organizations are not available on Support Essential. You must have Support Team, Professional, or Enterprise and Guide Professional or Enterprise to create user segments as described in this article. A user segment is a collection of end-users and/or agents, defined by a specific set of attributes, used to determine access to Help Center content. User segments are the building blocks for user permissions. You apply user segments to a knowledge base article or a topic in your community to define viewing access. And you use user segments to build management permissions that you apply to knowledge base articles to define editing and publishing permissions. Guide Managers have access to all content, regardless of any user segments they belong to. You must be a Guide Manager to create user segments. Signed-in users can be restricted by tags and/or organizations. When you create a user segment for signed-in users based on tags and/or organizations, any signed-in user who has all of the specified tags (on their user profile or inherited through an organization) and belongs to at least one of the organizations will be included in the user segment. This applies to agents for tags, but organization is ignored for agents; agents do not have to belong to the organization. Staff (agents and managers) can be restricted by tags and/or groups. When you create a user segment for agents based on tags and/or groups, any agent who has all of the specified user tags and belongs to at least one of the groups will be included in the user segment. Guide Managers have access to all content, regardless of the user segments they belong to. You can define user segments as shown in the following table. 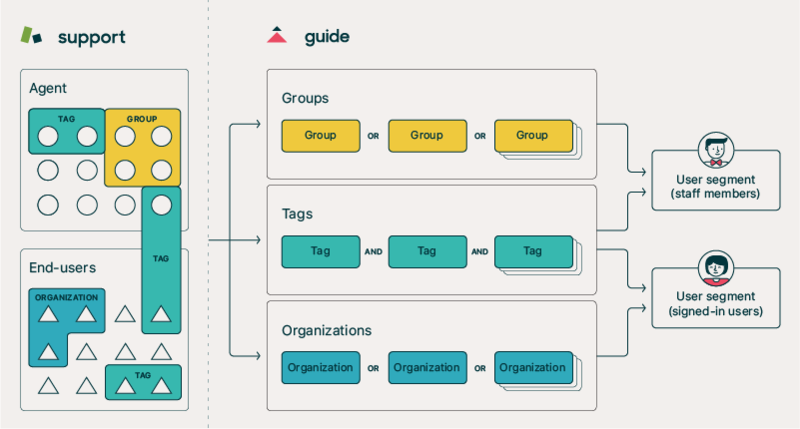 This diagram visually shows the two user types and how you might apply tags, groups, and organizations to define a user segment. There are two access types for user segments: signed-in users and staff. You can create as many as 200 user segments per account. If you have multiple brands in your account, your user segments are shared across all brands. Guide Managers have access to all content, regardless of any user segments they belong to. In Guide, click the User permissions icon ( ) in the sidebar. On the User Segments page, click Add new. If you receive an error message, then you have reached your maximum number of 200 user segments. You can delete some user segments if you want to continue. Enter a Name for this user segment as the base of your user segment. Signed-in users include internal and external users who create an account and sign in to your Help Center. Staff are internal users only, including agents and Guide managers. Click Add tag if you want to restrict by tag, then click the drop-down to find a tag to apply to this user segment. You can search or scroll to find tags, but note that not all available tags appear in the list. You can choose any tag that is applied to existing users or organizations. The tags can be on the user profile or, for end-users, inherited through an organization. Note: You must have user tags enabled to create a user segment based on tags (ee Enabling user and organization tagging). A list of matching users appears below. Any agents with the tag will belong to the user segment, but agents do not appear in the matching list. If you want to add another tag, click Add tag again, then select a tag. You can add multiple tags. A user, including an agent, must have all of the specified tags to be included in the user segment. For signed-in users, click Add organization if you want to restrict by org, then click the drop-down and select an org. For staff members, click Add group if you want to restrict by group, then click the drop-down and select a group. The user must belong to at least one of the organizations or groups to be included in the user segment. The exception is that organization is ignored for signed-in agents. Agents do not need to belong to any of the organizations to be included in the user segment. The list of matching users updates, but, remember, agents do not appear in the matching list. Would like to know can we also restrict categories too? Because we use categories for different products. Your Guide content can only be restricted at the Section level. But if all Sections in a Category are restricted to a specific user segment(s), the Category itself will only be visible to that segment. This article mentions Organizations but I do not see this option when editing a segment. Is this not an option anymore? It does seem to be there when creating it initially. Well I get it now.. Orgs goes away when i try to use it with agents and managers. The problem is we want to lock a section down to only certain agents and it does not seem to be working. It's a very specific number of people with a tag of xxx_support and it does not seem to be hiding it from other agents. And it have tried just signed in users and the tag xxx_support and it still shows up. I messed with it a little more. Even with my 'tag' on the user segment it is showing to all agents unless they are on specific roles. There are three roles that this section isn't visible to. Agent, Guided view, and light agent. All other roles can see this section. Even if the user does not have the specified tag. -Can knowledge base content be restricted at the article level or is it limited to entire sections? -Also is there a way for the article titles to appear to all user segments, but not necessarily be accessible? By way of having a lock icon near the content, for example? Thanks for your questions! As far as restrictions go, that happens at the section level, unfortunately it's not available on an article-by-article basis. The functionality to show but be inaccessible is not natively available. However, someone in the community may have a workaround or suggestion for you there. Ed - I'm not sure about the answer to your question, but I'm looking into it. I am wondering if using groups might be helpful here. Standby. Are your agents also members of at least one group? In order for the user segment to apply to an agent, they must both have the specified tags and belong to at least one group. I had a thought--Guide managers can see all sections of your KB regardless of any restrictions. So check to see if the roles that can view the section have "can manage Guide" enabled. Yes if you have have manage guide you can not hide anything from them. But the way it works is not ideal. The section we want to use is for only a select group a agents. We have some agents and some outsource agents that are allowed to manage guide and create articles. The section we want to create should only be visible by 4 or 5 agents at most. But that is currently not possible in Zendesk. We tried to use Orgs, but that isn't possible with agents/managers. We tried to use Tags but those are ignored for agents. So we are stuck with no where to go for this. I'm sorry that it's not working for your use case...I think the general idea is that if you trust someone to create and edit content in your Guide, you trust them to see all of that content as well. As far as I can tell there isn't going to be a way to work around this short of keeping that specific documentation elsewhere, like in Google Drive or Dropbox. You could perhaps put a link to the external resource in the corresponding articles but have it restricted so that even if Guide Managers click them, they won't be able to see the contents. I know it's not ideal, but it would get the job done. I'd also encourage you to post in the Product Feedback forum about this use case. I don't see anything there to that effect right now, but it's a sufficiently unique one that I'm sure our Product Managers would be interested to see it (even if they're not able to respond). Is there any talk of increasing the maximum # of user segments? We weren't aware of the limit as we built out our helpdesk instance and were planning to use the functionality to restrict access on a per-customer basis to certain user-specific content. Thank you! Welcome to the Zendesk Community! You know, I can't say we've gotten many requests for additional user segments. Can you tell us more about your use case? We post customer-specific content (i.e. co-branded marketing materials) on our Guide and therefore need to restrict access to those articles/section on an organization-by-organization basis, which we have done thus far by using user segments. I'm going to create a ticket for you so we can talk more about what you need. - What i need to do/pass when we authenticate user such that Zendesk HelpCenter knows which User segment the user belongs to? - Similary , What is need to specify in Web Widget so that Help articles are shown specific to User Segment ! If you are using Single Sign On with JWT or SAML you will need to pass whichever values you have configured your User Segments to use. These will either be User Tags or Organizations depending on which option your team has decided to use when setting up your User Segments. If you want restricted content to shown in the Web Widget you can find instructions for setting that up in Using restricted Help Center content with the Web Widget. I'm trying to ask for a best practice if we are using product name labels (e.g. product-a, product-b) to segment our clients for different products. Everything works fine so far, but a side effect of using labels is that if a client create tickets, those tickets will also inherit the product tags too. Hey Clement! Sorry for the delayed response! User tags and Organization tags are always inherited by tickets submitted by those users/organizations. However, having these tags on your tickets shouldn't impact anything, as long as you don't have any triggers or automations set up do so something based on those tags. If it's really a problem to have those tags on the tickets, you can set up a trigger to remove them from the tickets when they're created, using the Ticket: Is > Created and Tags > Contains at least one of the following conditions, and the Remove Tags action. I have been trying to figure out how to get access to user segments programmatically. Within home page i want to hide a block of code based on whether user is part of a specific segment. I know for role there is `helpdesk.user.role` but i dont know what it is for segment. 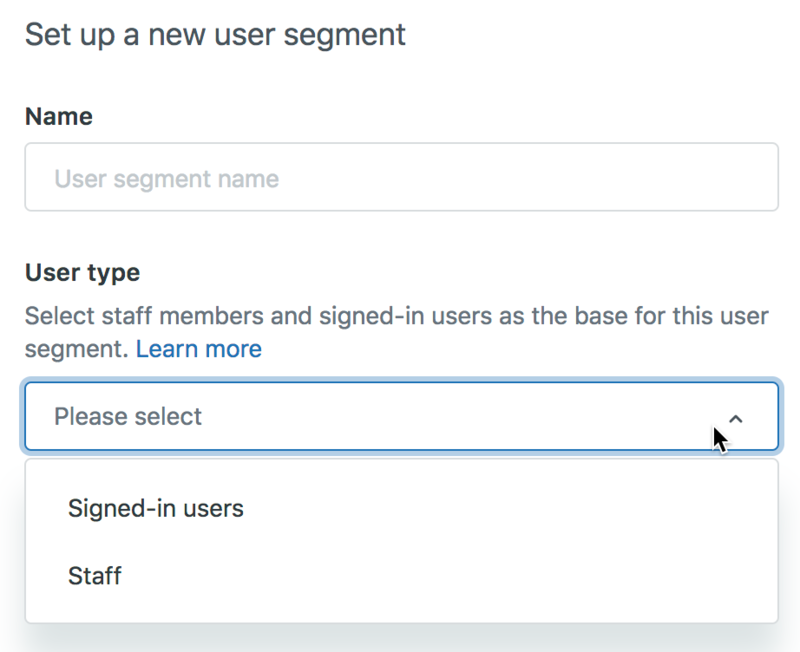 You can access User Segments from the Help Center API or are you looking to identify a logged in users segment? If so, you can use `HelpCenter.user.tags.indexof` to identify users by tag. This article indicates that with guide professional you can restrict articles depending on what organizations. However, when I try and create an new organisation I am not presented with this option. How do I do this? Am I on the wrong plan? You have to first create the organization in Support and add users to it. Then go to Guide and create your user segment. In the organization field for your user segment, start typing the name of the organization you created and it should pop up for you to select it. I have a section that needs to be available to two different user segments. User Segment A has tag A and User Segment B has tag B. Doesn't look like I can assign more than one segment to a section so thought I'd create a new segment called User Segment A and B with tag A and tag B. But since it requires the organization to have both tags, I can't do that either. I need a situation where if the organization has tag A or tab B they can access the section. Any ideas on how to do this that I may be missing? @Jennifer, woudl that work ? Do just select as many as you need for each section, click update, and you'll be all set! Thanks for the additional info but this creates an "and" scenario, right? So the org has to have both tags to see the section? I need an "or" scenario where a user can see a section if they have at least one of the two tags. I tested adding multiple User segments to a Section as you suggested, and I'm not sure that option is available. If you go back to the drop down and select another segment, it simply changes the applied User segment to the new selection and removes the prior selection. Maybe I'm missing something though? "...any signed-in user who has all of the specified tags (on their user profile or inherited through an organization) and belongs to at least one of the organizations will be included in the user segment..."
If you're using tags, users must have all the tags listed. But if you're using Orgs they only need to belong to one of them for the restriction to apply. I hope that clears it up for you! Yep, see what you are saying. Unfortunately, we need this for the tags assigned to the user segment. We don't assign the user segments on an org level and it wouldn't be a good workaround for what we need. Love the user segment functionality and it has helped us a lot but not having the flexibility to assign multiple segments to a section or being able to assign multiple tags to a user segment and allow for an "or" scenario is limiting us in some places unfortunately. I think Jesse may have been referring to adding multiple organizations to a single user segment. In this way you can restrict access to a user who is part of any of those organizations. To accomplish this, when you create your User Segment, you can start typing the name of your organization and select it when it pops up. Then you can start typing a second or third organization. This will create a single user segment for all of the users who are part of at least one of the organizations listed. Once you have done that, you can add it as a restriction in your sections and it will list all of the organizations who have access individually as depicted in her screenshot. We are starting with Zendesk Guide and would like to make 2 user segments: our customers and our internal/external colleagues. From what i gather, we can only restrict knowledge base and community? We would like to create two seperate pages to submit tickets and only allow access to one user segment each.